Elven weapons and light armor are medium-quality items that are made using the mineral moonstone. The weapons and some of the armor require quicksilver as well as moonstone. Elven forging techniques were developed by the Altmer and were originally a closely guarded secret (see Light Armor Forging). Three moonstone ores are obtained by mining moonstone ore veins. One refined moonstone is obtained by smelting two moonstone ores. Elven Smithing requires 30 or greater Smithing skill. Elven armor is level 12 light armor, made from refined moonstone, iron ingots, leather, and leather strips. Elven weapons are level 19 weapons, made from refined moonstone, quicksilver ingots, iron ingots, and leather strips. 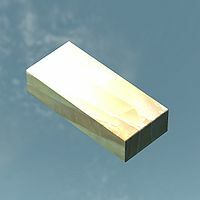 Refined moonstone is also used when forging glass weapons and armor. Refined moonstone may be sold by blacksmiths starting at level 6 and general goods merchants starting at level 4. Moonstone ore may be sold by blacksmiths and general goods merchants starting at level 10. 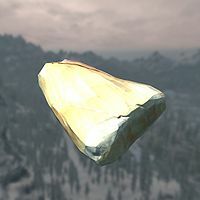 Moonstone ore may be randomly found in Falmer loot starting at level 7. There are a total of 44 veins, 6 ores, and 9 ingots at guaranteed locations. Some individual veins that are located outside and are not near any landmarks have been left out of the following list. The Moonstone Veins category also provides a list of locations containing veins, and all exterior ore veins are shown on (map). Elven Smithing is the first perk in the Light Armor branch of the Smithing skill's perk tree. Unlocking it requires a Smithing skill of at least 30, and the Steel Smithing perk must have already been unlocked. Elven Smithing allows elven armor, elven gilded armor, and elven weapons to be crafted. The Elven Smithing perk also causes tempering of elven weapons and armor (including elven gilded armor and elven light armor) to be twice as effective. This perk applies to both unenchanted elven gear and enchanted gear (generic armor, generic weapons, or custom), as long as the Arcane Blacksmith perk has been unlocked. Tempering of several other items is also improved by Elven Smithing, namely: Borvir's Dagger, Firiniel's End, Herebane's Courage, Herebane's Fortress, and Auriel's BowDG. Elven armor is a medium-quality armor with several variants. Standard elven armor is better quality than leather, but lower quality than scaled. However, it is also the lightest set of armor in the game. It appears in leveled lists starting at level 12 (enchanted varieties at level 13). Elven gilded armor is an improved version of the cuirass that is also unlocked by the Elven Smithing perk, but is created using quicksilver in place of leather. Its armor rating is 6 points higher, making it better than scaled armor, but has the same weight as standard. However, a full set of elven armor when equipped with the elven gilded armor has the same total armor rating as a full set of scaled armor. It appears in leveled lists starting at level 27 (enchanted varieties at level 28). 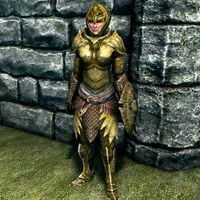 Elven light armor is a variant worn by the Thalmor that includes boots, cuirass, gauntlets, and helmet, but no shield. It cannot be crafted by the player, and does not appear in leveled lists. Despite its name, it does not weigh any less than standard elven armor, but is of lower overall quality (with the same armor rating as leather armor). All versions of elven armor can be tempered using one refined moonstone, with the exception of elven gilded armor, which is tempered using one quicksilver ingot. Having the Elven Smithing perk doubles the quality improvement. Any combination of elven and elven light armor qualifies for the Matching Set perk. However, elven gilded armor does not match any of the other pieces. 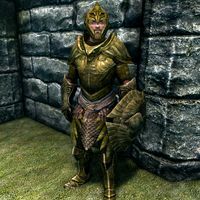 Therefore, for characters who have unlocked the Matching Set bonus, the elven gilded armor cuirass is effectively of lower quality than elven armor cuirass. This was fixed by the Official Skyrim Patch v1.9. Any combination of elven, elven light, and gilded armor now benefits from the Matching Set perk. Elven weapons are medium-quality weapons that are better than the weapons associated with medium-quality heavy armor, (Dwarven and Orcish), but not as good as glass or ebony. They appear in leveled lists starting at level 19 (enchanted varieties at level 20). All items except ammunition can be tempered using one refined moonstone, and having the Elven Smithing perk doubles the quality improvement. Arrows can only be smithed if the Dawnguard add-on has been installed. † The base gold value used for all generic enchanted versions of the elven bow is 165 instead of 470. This means that the enchanted weapons are 305 gold cheaper than they should be, and in several cases are cheaper than the unenchanted bow. This bug is shared by several types of bow in the game. Elven armor can be a better overall choice than light armors made from higher quality materials: with sufficient Smithing and Light Armor skill levels and perks, elven armor can be improved well past the Armor Cap of 567, at which point there is no advantage to upgrading to scaled, glass, or dragonscale armors. In fact, there would be a disadvantage due to the increased weight of those armor types, unless you have perks negating the weight of worn armor. If you are carrying an elven sword, guards may ask, "Why the Elven blade, hmm? Nord steel not good enough for you?" Moonstone jewelry can be found in random loot (i.e., Copper and Moonstone Circlet and Silver and Moonstone Circlet) but cannot be crafted by you. 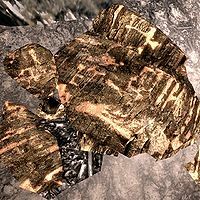 Moonstone (ore or ingot) is one of four items needed at the Atronach Forge to create a Staff of the Frost Atronach. Moonstone ore can be sold to Perth for the quest Mine Ore. Temper recipes are found[verification needed — Where?] for elven gilded boots, gauntlets, helm and shield, meaning they may have been planned at some point during development. Elven war axes receive no benefits from the first rank of the Hack and Slash perk, just from rank 2 and 3. This page was last modified on 6 October 2018, at 00:56.